FINALLY, Dr Jeffrey Glassman's recent paper is available in PDF form it's hosting site also offers a good summary of the direction his research has been taking. 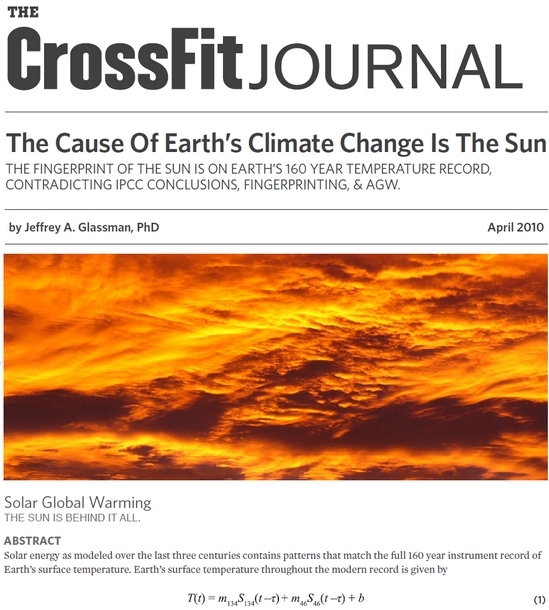 The CrossFit Journal is proud to present this extraordinary article by Dr. Jeff Glassman. Formerly the Division Chief Scientist for Missile Development and Microelectronics Systems Divisions for Hughes Aircraft, Dr. Glassman has dedicated his career to improving the quality of science methodology among his peers and the community at large. For years he has been disturbed by the lack of credible science identifying human activity as a cause of global warming. This paper is the latest of six papers published on his blog, Rocket Scientist’s Journal, and the first to advance the Sun as the cause of global climate change in the fine detail of the temperature record since the invention of the thermometer.